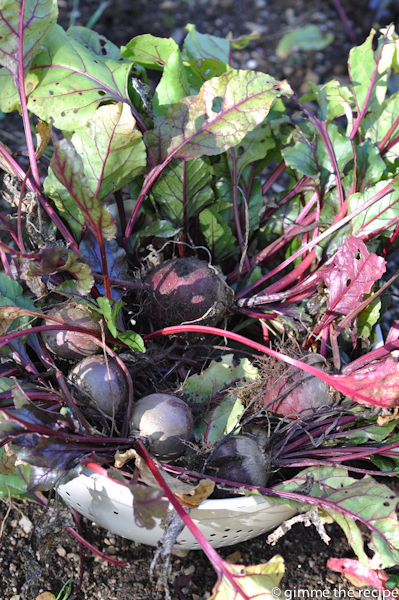 The beetroot have been bulging through the soil lately with their leafy tops waving frantically ‘pick me’, ‘pick me’ and as there’s only so long that those red veined leaves will wave so frivolously for, their time has come. As I began assembly for this year’s Beetroot Relish I deduced that I must have cheated and bought some in to supplement their masses last year as there was no way I had reaped the 1.3kg that the relish recipe required. This year I had about half that so I just adjusted the recipe downwards and don’t have a plethora to dispense just yet but I do see myself buying some additional beetroot to make more relish as gifts for Christmas. 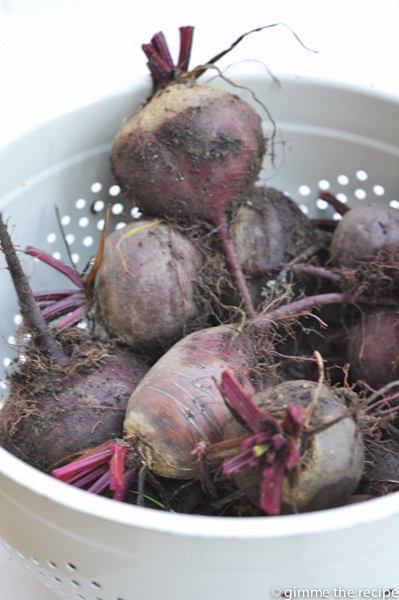 If you’ve dug it up from your own garden you will firstly need to top the beetroot to remove the leaves and most of the stalk (the leaves can be cooked like spinach leaves if you like – wilt them down and add butter, salt and pepper). Remove most of the leaves and stalks by cutting with a scissors leaving about an inch of stalk remaining. I wear rubber gloves when preparing beetroot. 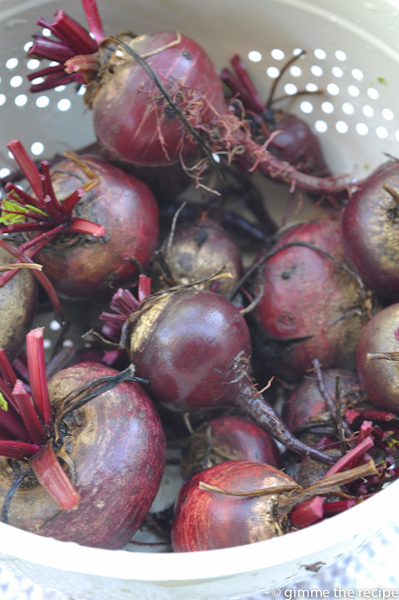 Once topped then gently wash each beetroot under the cold tap being careful not to be too vigorous and damage the skin. Place on kitchen towel to remove excess moisture. Once washed they are ready to bake. 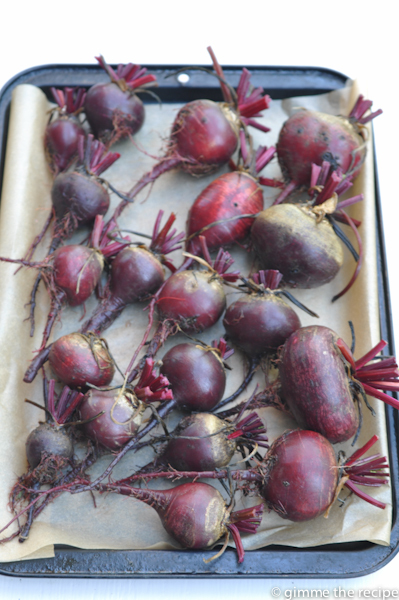 I prefer to bake/roast beetroot as I think it retains their flavour better and requires minimal monitoring. Pre-heat the (fan) oven to 180C. 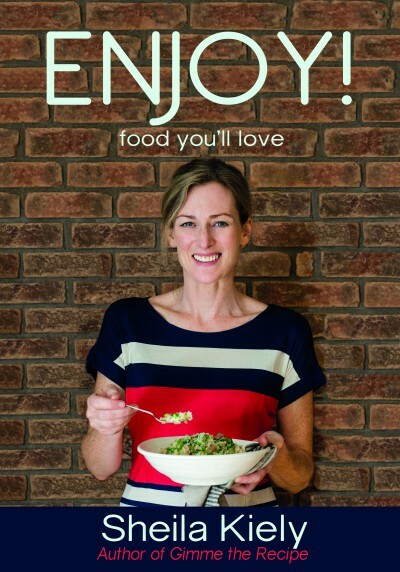 Place the prepared beetroot on a tray lined with baking paper. Roast in the oven until the beets are tender enough to allow a knife pierce through, still bitey but yielding to the knife. Roasting time will vary depending on size. My small ones took around 50 minutes+ with the bigger needing 1 hr 10 minutes. Once cooked remove the tray from the oven and leave the beets to cool for a bit until able to handle. Wearing rubber gloves the skin may gently rub away or use a small paring knife to peel them. Delicious served warm with some goats cheese and wilted leaves or you could allow them to cool and prepare a beetroot relish/chutney. 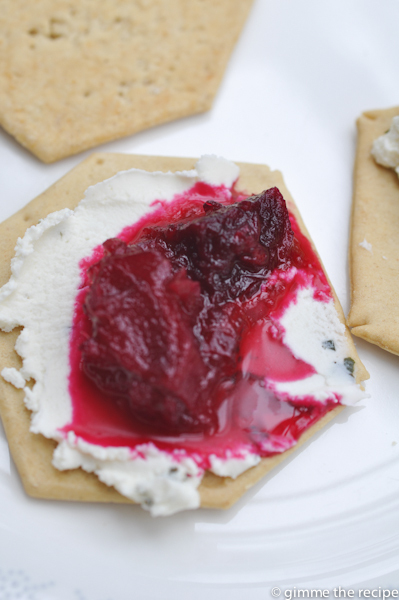 As mentioned previously I do like to make Beetroot Relish and think it makes a lovely Christmas gift combined with some great Irish cheese and crackers. 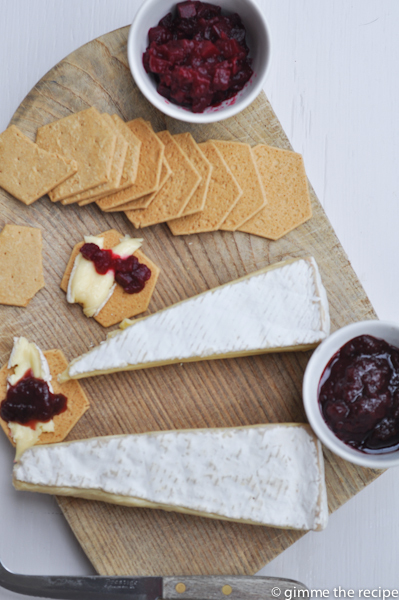 Relishes and chutneys are a great way of making cheese a little bit more special and there are numerous variations on offer at farmers markets and on the shelves of the supermarkets. 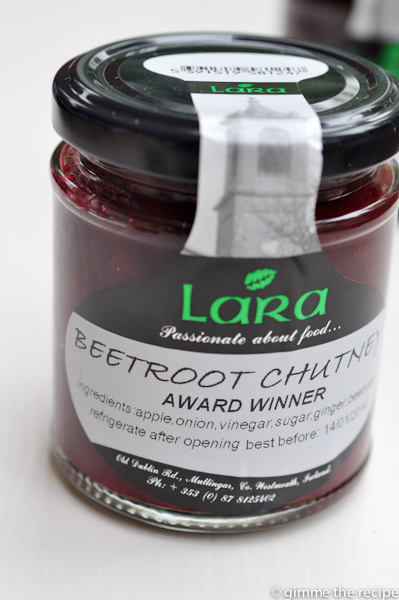 Recently I came across the Lara range in Scally’s SuperValu in Clonakilty and I tried both their Plum Compote and Beetroot Chutney . Tipperary brie by Cooleeney Farmhouse Cheese was on offer on the day so I picked up two wedges and it was delicously creamy and ripe. 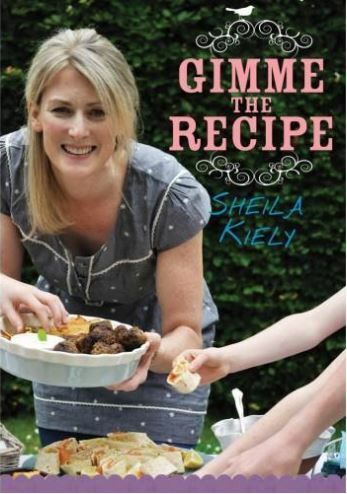 I do hope you get to try some delicious Irish Beetroot Chutney soon. I have peeled, chopped, seasoned, oiled, roast and then blended them to make a purée. Nothing as nice as fresh beetroot. 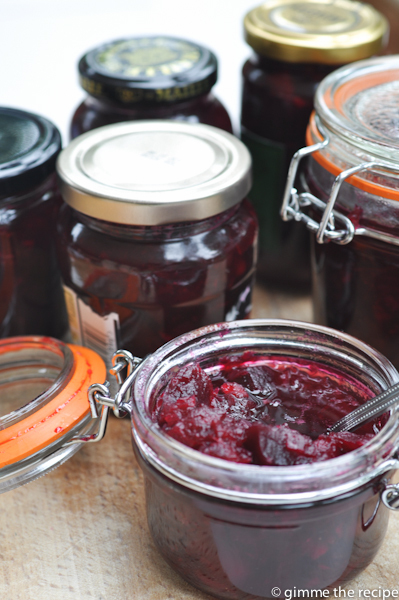 For years, I believed that the tart vinegar soaked stuff from the jar was how it came. Live and learn.